Hey, welcome to another RPG :D.
This is going to be kind of like Pirates of the Caribbean. Ok, so here we go with the rules. You can be a pirate, member of the Royal Navy, a member of the East India Trading Company, or finally, one of the cursed. The Cursed are basically immortal, so I would prefer only EXPERIENCED RPers make one of those. Be consistent. If someone sinks a ship don't suddenly see it sailing on the horizon. You can kill your own characters and NPCs, but you can't kill someone else's character without their consent. You can wound them however. Your weapons must fit with the time period. And you must be able to carry them. So you can't run around with a cannon. They have spread, commanding their own ships once again. Weapons:Six flintlock pistols, one Cutlass. Ship:The Blood Saber a captured East Indiaman with blood red war paint on the sides. Brief History: Joined the crew of the Blood Saber at the age of 16, was elevated to a higer rank aboard the ship, led a mutiny, took the ship for his own. Captain John Strauss of the Blood Saber stood at the wheel of the vessel. The fog made it diffucult to see. Docking would be difficult. He was heading to Tortuga, a refuge for those like him. His ship needed to be re stocked, and if he were to gain any new crew members it would be an added bonus. Brief History:(Optional) Jack never talks about his past, it is a mystery to even his closest friends. 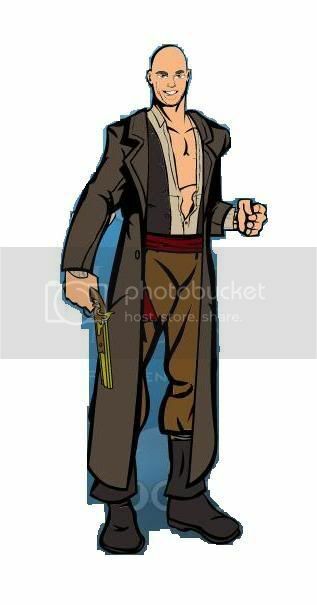 Weapons: 4 flintlock pistols, 2 cutlasses, and a dagger he stores in his boot for emergencies. Brief History: Was kidnapped by french pirates at a young age, grew up with them, in time took over the ship and crew. Personality: Calm, jovial, flippant even under severe presure, but when he gets serious, he's dead serious. Brilliant strategist and all-around smart person, a sort of Jack of all trades. Occasionaly speaks in nonsensical technobabble. Captain Eccleston kept a steady hand as he steered Mauvais Froid through the thick and soupy fog. He didn't exactly know where he was headed, but hey, they'd end up somewhere eventually, right? That's how David lived his life: Making it up as he went along, but doing it brilliantly. this is hilarious. my school just did a musical called Pirates of Penzance. and pirates own ninjas. Weapons: two swords, dual pistols with multiple shots for each, hidden knives. Bio: Born of Italian and English descent, Riff lived in Penzance for 12 years before his town was raided by John Strauss. Being taken aboard, Riff joined the crew of the Saber and eventually worked his way to First Mate. Weapons: Is skilled with using two lighter weight swords, carries a pistol and has a hidden dagger strapped to her ankle at all times. Personality: loves winning, is a fierce and aggressive fighter, but when there is no threat, she can be very lade back and has a good sense of humor. Background: father was a pirate, when her mother accidentally let slip of this, she went to go find him. For a while, she stayed with him and his crew, until very recently when the crew led a mutiny on him, killing her father and leaving her in Tortuga. Appearance: http://i236.photobucket.com/albums/ff78 … ateRPG.jpg about 5'6"
Companion: A falcon, Arram, that her father got her when she turned 20. Arram is completely loyal to her, always coming back after being let free. John's crew secured the ship and lowered the gangplank. He slowly walked off the ship, taking in his surroundings. Tortuga was the same. A island full of drunkards, pirates, and prostitutes. It wasn't much, but you could get what you needed, provided you had something to trade in return. What John needed were supplies, and being a port, Tortuga had plenty of those. He also needed some new crew members, he had lost four men when they had boarded a galleon. Finding someone willing to join his crew wouldn't be hard, but finding someone who would be useful would. Renavel stared at the ship and its crew, who had just finished securing the ship and lowering the gangplank, allowing what looked like the captain to walk off. She watched as the crew made some final adjustments. Interesting, she thought, a ship of that size usually had a few more members. She remembered how some of the pirates thought it was bad luck to have a woman on board, but it couldn't hurt to ask if they could use a new addition to the crew. John regarded the newcomer with some surprise. Her timing was surprising. She looked like she was qualified. She could be useful, he held out his hand in an unspoken agreement. She took his hand and shook it. "Welcome aboard. We need supplies, but we're setting out soon after we restock." She nodded. John started walking away, he had a few things he felt like checking on. The streets of Tortuga were as they always were, loud. He looked over his shoulder, Renavel was following him. He continued to walk stopping in a few taverns and shops, eventually making his back towards his ship. Soon enough he was back at the docks. He got back aboard his ship, they had about finished re-stocking. He made his way to his quarters, he needed to figure out where they were going next. He had picked up a map, with trade routes for the EIC. He sat down at his desk, and began going over his charts. Waking up, Riff realized that he fell asleep shortly before they docked at Tortuga. Thinking that the captain had gotten off, Riff left the ship and entered a bar, where he figured the captain would be recruiting people or bartering for supplies. When he saw no captain, Riff returned to the ship to find lights on in the captain's room. "He must've been here after i woke up." Seeing that the ship was filled with supplies and the usual work going on with the rest of the crew, Riff was relieved. Then, the most peculiar thing caught Riff's eye. A woman was standing beside the ship on the docks, eying the crew as they eyed her back. Jumping back off the ship, Riff decided to introduce herself. "Hello, there, lass. I'm not sure of your intentions, but the crew and ye seem to be staring each other down. Are you joining us? If so, I'm Riff, and am First Mate to Cap'n Strauss. Don't worry about the rest of the crew, they just like to give that glare to outsiders." Riff stuck his hand out, waiting for the woman to shake it. Appearance: Shorter than most of the Europeans, and more petite. Has beautiful clear blue almond shaped eyes. Long black straight hair that is usually elaborately braided and coiffed. Loves to wear large jewelry and does so often, along with the silks that are traditional to her area of origin. Weapons: Carries two narrow, shorter than average blades, two short knives strapped to legs and one pistol. This is in addition to her prowess in the deadly martial arts. Brief History: Sold into slavery as a young girl in Singapore, she grew up longing for freedom, but learning many different valuable skills, including martial arts, along the way. At the age of 15 Oki managed to escape her bonds, by taking the cooking knife and using it to kill the slave driver when he tried to get to close and friendly with the maturing girl. In order to flee the city and stay out of slavery and being found, she disguised herself as a boy and joined the crew of a merchant vessel. Eventually this vessel was boarded by pirates and rather than killing all on board, made an offer to the survive to join the crew of the pirate ship, The Black Opal. This is how Oki made it to the new word, traveling as a merchant and pirate. Eventually after 10 years at sea, she was made First Mate, and finally made it public that she was indeed a woman, although many had known or suspected. The captain at the time, decided it did not matter, as Oki was by far more competent than the rest of the crew. This is when she began to develop her unique sense of style. She took over as captain when the previous captain died suddenly of unknown causes, but was thought to be just old age. Oki has run a strong campaign against merchant vessels ever since. Willie pulled out his cutlass from the pirate's gut and kicked him over board. "CAPTAIN Willie to you!" He yelled drunkingly at the falling corpse. He turned and saw the blood on deck. "Sally!SALLY!" He called. A large, muscular black man came running out from the lower deck and stood at attention next to Willie. "Yes-s sir?" Solomon said nervously. "Didn't I tell you ta clean dis up!? HAH?!" "WHAT DIDJOO SAY SALLY!!!!???" Willie yelled brandishing his bloody cutlass. "I said that yes sir, you told me to clean up this mess." "Thats DAMN right Sally, dont you SASS me!" Willie said and began to walk away, tossing the empty rum bottle in his left hand over board while sheathing his cutlass. Willie sighed with accomplishment. Another drunken tirade complete. He walked to the captain's quarters and collapsed upon his bed. 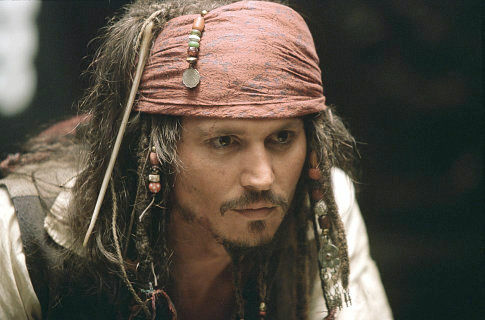 They would reach Tortuga in a few hours, he would sober up till then......so he could get drunk again. Personality: Calm and cool most of the time, but can lose his temper very easily. Captain Eccleston continued to steer Mauvais Froid through the soupy fog. He had been at it for awhile and was getting hungry. "Tyler!" He yelled over his shoulder to the crew. "Tyler, fetch me a banana, will you?" A young blonde girl scurried down into the interior of the ship, looking for David's favorite treat. Moments later, she emerged from the barracks empty-handed. "We're out of bananas, captain!" She said. "Whuh--wha--excuse me?!?" David was indignant. "How did we--arrgh! Out of--are you--gah! Ms.Tyler, you better not be joking here..."
"No sir, see for yourself." "Fine, I will." David stepped down from the wheel and got a nameless and unimportant crew member to steer the ship. Moments later, David and his crew had set a course for David's favorite port to stock up: Singapore. Age: unknown, appears to be in his mid 40's. Weapons: 2x English Flintlock Blunderbuss w/ Grenade cups, 2x French Flintlock Dagger/Pistols, cutlass, a large collection of exotic blades and daggers. Ship: The Harbynger, has 5 staysails making it easer to sail against the wind than running before the wind. It is armed with port and starboard guns. It carries 46 broadside 6 pound guns, 23 on each side; 18 guns are located on the main deck, 20 on the gun deck, and 8 on the upper deck: 4 on the quarter-deck and 4 in the forecastle. The gunports on the gun deck are in the shape of wailing, tormented faces, with the ports appearing at the mouths. Its full broadside contains 23 cannonballs, called shot, and weighs one hundred and 62.652 lbs. (38 kg). On the bow however, she mounts a pair of bow chasers, each in the form of a triple-barreled gun. Each separate barrel fires individually, but the trio rotates to present a fresh barrel to fire again in the style of a Gatling gun. The empty barrel can then be reloaded for its next turn. This enables The Harbynger to continually fire at the ships it is pursuing. Brief History: Mary was born to a poor Irish family and was taught by her mother about the healing properties of various herbs. At the age of 14 she was spotted by an Indian trader named Zeb Prakash who wanted to marry her. With a sizable amount of money exchanged to MaryÃ¢Â€Â™s father, Mary found herself betrothed to Zeb. After they married, they travelled from port to port until Zeb found a need for snuff. With Zeb supporting a snuff addiction Mary is left to fend for herself. She has become a famous healer and is often sort after when she is working of an evening as a barmaid. Thankfully her husband is still alive so she can use him as an excuse to turn down many admirers. Mary is looking for a better life and has a feeling that her opportunity may lay in the direction of the sea. As Mary placed a handful of ales on the table she heard a series of wolf-whistles as her backside was faced at some patrons in the opposite direction. "Now there's a fine piece of crumpet," one Englishman sniggered. "Aye, pity she's still got her clothes on," another said and they burst into laughter. Mary turned around and placed her hands on her hips, "One the crumpet is not deaf and two she's a married woman." "Oh I beg your pardon ma'am," the first man said as he did a mock bow while his friends tried to hold back their laughter. Mary eyed him up and down, "Well I can see your certainly the type that needs to beg." An uproar of laughter followed as she walked away. Chances were the men would be so drunk by the end of the evening that they wouldn't even remember that she existed. Mary moved to the bar and was handed another four ales by the barman named Maurice, "T'is for the gents up the back." Mary eyed the corner to where Maurice was pointing and groaned quietly. It was the red coats and half the time the men thought they were able to get away with blue murder. Mary picked up the mugs and made her way over. Climbing aboard, Riff answered Renavel's question. "Oh, we've quite a fine ship. The rest of the crew tends to be crabby about new members 'n all, but they'll get used to you in a week. Mind if I just call you Ren? I guess I oughta take you to the Cap'n, 'e's in 'is room reading some maps 'bout where to head out next." Riff knocked on the door to the Captain's quarters, and let Renavel in. Weapons: a solid rapier with a brown handle and a golden hilt which has been sharpened along the edges so it can be used as a slashing weapon aswell. also has a Flintlock smoothbore rifle and a flintlock pistol, the pistol being graced with gold markings. Brief History: he was born into the royal navy, his father was vice admiral sir George Goodlad and so Richard had a naval upbringing. his father took him on his ship and taught him the 'ropes' of being a captain, he has risen in the ranks under his fathers guiding. but his father was lost at sea in the atlantic ocean. pirates had claimed his life allthough the pirates where never found they where believed to be lost at sea due to a feroucious storm. he now commands his ship on the waterways hunting down pirates and protecting the ports of her majesty. Richard stood in his room, he was expecting his first mate to come any minute now, they where docked at the port of st Lucia (this is in the Caribbean isnt it? if not i can edit) his ship had just been refurbished with new cannons which he was proud of. heavy bronze cannons. his ship was heavy and powerful but it was slow, very slow. his crew where new and fresh, with about 2 dozen veterans onboard. the rest had little or even no expierence of sea life, they knew how to do there job but could they do it under the conditions of a battle? Richard played with his rapier it belonged to his father and was all that remained of his deceased father. The admiral of the fleet here in this region had assigned richard to pirate 'hunting' duties and to protect the ports. John stared down at the nautical charts on his desk. There were two paths on his map, and one of them disappeared in the middle of the ocean. There was a quick knock at his door and he pulled another chart over the one he was studying. The door opened and Renavel walked in, followed by Riff. John walked over to greet them. "How do you like the ship?" Renavel walked into the captain's quarters, looking over at the desk which was covered in maps. Captain Strauss walked over to greet Riff and her. "How do you like the ship?" he asked. "It's a lovely vessel," she replied truthfully. She looked back over to the maps and voiced the question that had been sitting in her head since the moment she joined the crew, "Is there any chance you could tell me where we're headed Captain?" Richard began walking up the ramp to his ship, his marine detachment stood and saluted him. "sir we have 38 marines on this including myself to see to yours and the crews protection"
"Why thomas, you do not need to salute an old friend, i am reassured by your marines protection, you have some excelllent muketeers here. i thank thee"
"Thank you captain, great ship by the way, looks like naval command likes you" as he walked away giving him a wink. "listen up men! you've got tonight off to get a drink, you shall be paid later so enjoy your night, were off hunting tomorrow, and dont be coming back with hang overs" he shouted, he gave a cheeky grin and retired to his quarters for the night, he would write to his wife and children, then study the navigation charts and maps before sleeping. he'll be needing it. Appearance: 6'1". Blonde. Striking blue eyes. When he was human he was know as the Lady-killer. Personality: Is not like most pirates manners-wise. Very polite but when the need be he can be cold and cruel. Weapons: 2 Flintlock pistols. Carries an axe and scimitar.